My dad was born and raised in Minnesota, and although I’ve never lived in Minnesota, I always thought of myself as a honorary Minnesotan. And therefore, I also always thought that Paul Bunyan is also from Minnesota! Turns out, Maine claims Paul Bunyan as well! Apparently he was born in Maine on February 12, 1834. 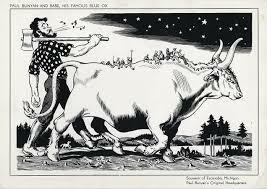 I’ve always loved reading tales about Paul Bunyan and his Big Blue Ox, Babe. To celebrate Paul Bunyan’s birthday, we’re writing our own Tall Tales this week! Tell us a Tall Tale of your own and then link it up here or at Second Blooming. Anything goes this week on the Spin Cycle! Gretchen and I will spin our own tall tales and post them on Friday. This sounds like fun. I hope I can come up with something. Oooh! Fun! I always thought I was terrible at lies and fiction. Then I started writing my “two truths and a lie” posts and actually tricking people! Although my tall tale would be so clearly made up. My tall tale will definitely be unrealistic! 😉 I’ve never tried it before so I’m looking forward to spinning up a tall tale. Janine Huldie recently posted…Girl Scout Creed & Cookies Sales – Does The Ends Justify the Means?